Sous-vide Cooking for a Fresher Taste - What's Your Temperature? Sous-vide (French for “under-vacuum”) is a style of cooking used frequently in instititutional, commercial, or high-volume catering kitchens. Thermodyne Foodservice Products, Inc. is a high end producer of large commercial food warmers, which are ideal for this form of food preparing. Why? Because in traditional sous-vide style, the food was sealed tightly in a bag and cooked in a highly controlled oven filled with warm water. Because Thermodyne’s equipment run on the patented Fluid Shelf Technology, they have become an ideal use for Sous-vide cooking and have many other benefits and uses that a typical sous-vide cooker doesn’t have the capabilities of. The secret to success is to heat the food for an unusually long time, under less than extreme temperature surroundings. This style of cuisine was invented in England in 1799, but was perfected and came under more general use in the USA in the 1960’s. The temperatures and duration of preparation are an art, different for each dish being prepared. 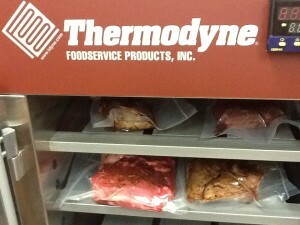 Thermodyne offers Commercial Food Warmers in a variety of shapes and sizes – from countertop to full size. “Commercial Food Warmers can hold food for extended periods of time without over-cooking or drying it out. Additionally, because the heat is maintained in the shelf rather than in the air, food is protected from unstable environments such as door openings, hot spots, and additional air flow.” The end product is fresher tasting and is maintained warmly for hours. The Fluid Shelf® system keeps the heat source in constant motion, allowing every square inch of surface to provide the same result. As compared to conventional models requiring perimeter heat sources or fans, Thermodyne units achieve more consistent and higher quality results making Thermodyne the most efficient hot food holding cabinet. Thermodyne sous-vide machines are used in the kitchens of some of the world’s finest chefs and now that cooking is gaining popularity from Europe to North America and everywhere inbetweeen. Sous-vide cooking produces succulent food that is neither tough nor soggy and avoids common kitchen borne illnesses, such as botulism. If you are setting up a large-scale kitchen for an institution, or experimenting with your own gourmet dreams, please contact us and open up a whole new array of delicious, fresh-tasting foods.